We all know it: when you want to be healthy, you need to eat healthy. But with all the choices you have at the grocery store, it can be very difficult to eat right. It is way easier to just warm something up or eat a snack that is loaded with sugar than actively prepare your food in a healthy way or read all the labels before you buy something. We don’t have time for that, right? For the biggest part, that’s true. But I have come to learn it is just a matter of habit and learning how to cook. That is the reason why I want to add another segment here on this website. There are a lot of cool products that can help you live (and eat) better. I know I’m not the first one to realize this or to write about it, but it seems like a lot of fun, so why not? Let’s give it a go, shall we? Recently I ordered a some of products from MyMuesli. This Germany based company specializing sells muesli and granola next to dairy free milk and tea. They also sell a couple of accessories to go with these products. For the last couple of weeks I have been looking for a good way to bring my granola and yoghurt to work. But we all know that when you throw the ingredients together, the granola will become mushy. I travel for 45 minutes to work each day, so by the time I get to work, my granola is ruined. There are a lot of container products available, but the cup I got from MyMuesli is just better than the rest. 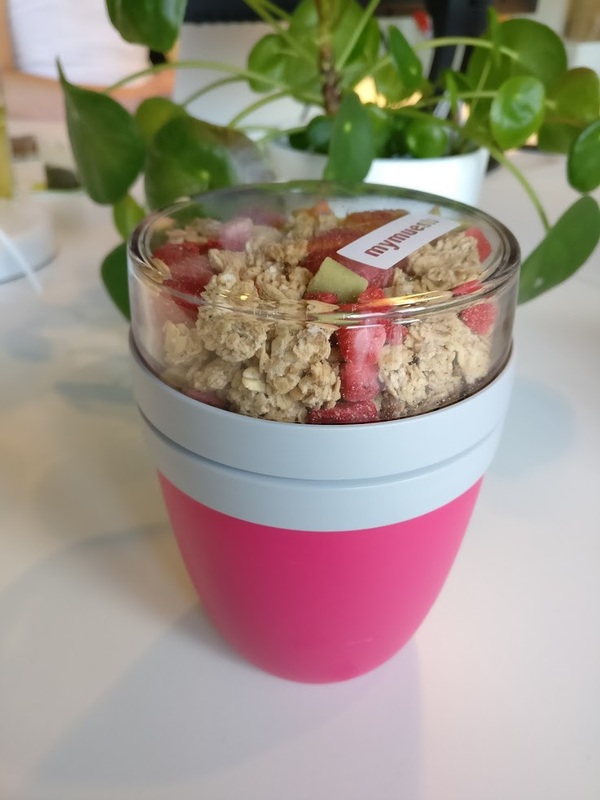 The cup is divided into two containers: one for your yoghurt and one for your granola. They both have their own separate twisting lid and the top container is transparent, so you can see which granola you brought with you. They are available in three different colors: magenta, white and black. And best of all: they are dishwasher safe! The second product I got is the 2go bottle from Tree of Tea. This glass bottle has a little container in the top, where you can put your tea in. Basically genius, because your tea will be mixed from the top and there is no need to stir it. If you prefer fresh-from-the-garden tea, you can always put some leafs in the bottom of the bottle. Just place your container on top of it and your bottle is sealed off. 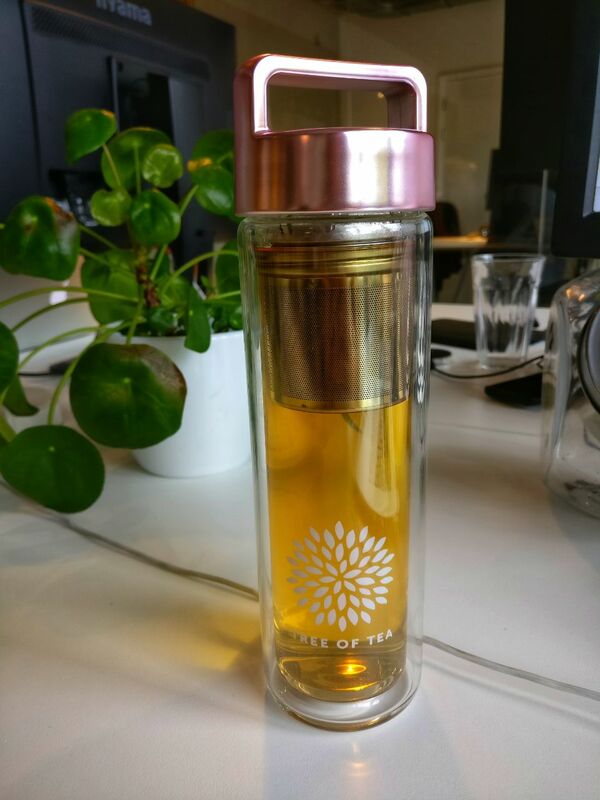 The bottle is double walled, to keep your tea warm. If you are anything like me, you have a habit of making tea, forgetting about it and drink cold tea as a result. I haven’t managed to do that yet with this bottle! I use both my cup and my bottle on a daily basis at work. And even some of my colleagues got the 2go cup to make a habit of not skipping out on breakfast. If you want to order yours, go to mymuesli.com. They regularly have great freebees that come with your order.